You just know that women's mechanical watches are having their day in the sun when a watchmaking Master unveils a complex timepiece created just for women - not only that, it's a groundbreaking model too .... and who better than the feisty F.P. Journe to think it, pen it and make it? Lay off lads, this is the F.P. Journe Elégante. Ok. So it has a girly name. And a sparkly option is available, but beyond mere aesthetics, the Elégante is a very unusual wristwatch. Inside that curvy Tortue case is an Electromechanical Quartz movement, one that automatically slumbers after 30 minutes of inactivity thus preserving its own power supply. When in stand-by mode, the microprocessor in the movement continues to keep time, while the other components rest. When the watch is put back on, it restarts and those razor-sharp hands scurry around the dial until they indicate the correct current time in an industrious and captivating spectacle. In a further stroke of energy-saving prowess, on wakening the hands will choose the shortest route to the the required time, moving in either a clockwise or counter clockwise direction. The motion detection oscillating weight is visible on the dialside at 4 o'clock. The F.P. Journe Calibre 1210 which consists of 126 parts combines familiar mechanical components with a low consumption processor which has a quartz frequency of 32,000 Hertz, but despite its unconventional technology, the movement still receives the meticulous finishing which you'd expect from anything signed with the name F.P. Journe. With daily use the processor will last 8 to 10 years, on standby expect a lifespan of closer to 18 years. Despite the fact that the F.P. Journe Elégante packs in enough new technology to indulge even the most nerdiest of watch nerds, it is still delightfully feminine. Some features synonymous with the watchmaker remain, such as the slightly curly numerals and the distincive hands. In the section between dial and bezel there are contrasting finishes and visible screws adding further eye-pleasing details and, even though this is his first collection for women, François-Paul Journe has pulled out all the stops and it will be available in both titanium and gold case editions with a wide choice of straps. The man is quite simply a genius, but then you knew that already. 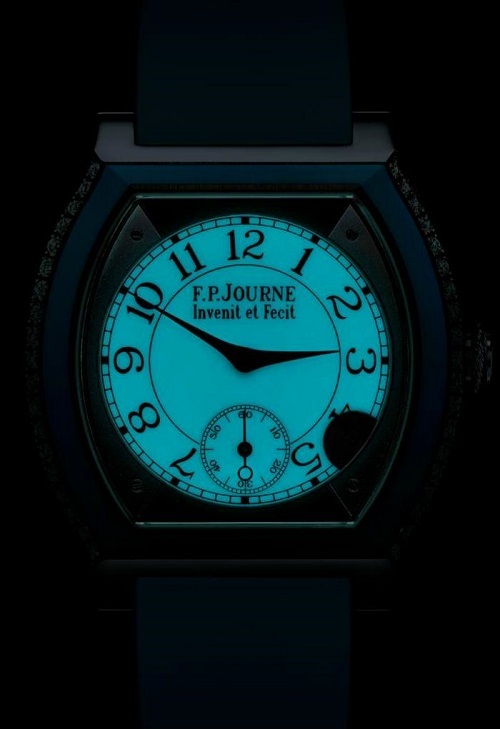 More F. P. Journe in our extensive archives.